The AmDTuning.com with Cobra Exhausts team enjoyed its best weekend of the Dunlop MSA British Touring Car Championship so far with four points finishes – including two top tens – at Croft. The West Thurrock-based team made the long trip to North Yorkshire keen to build on the impressive pace shown by its Audi S3 last time out at Oulton Park, with Ollie Jackson and Ant Whorton-Eales both picking up seasons best results during the weekend. Ollie qualified 21st on the grid for race one following a qualifying session that had to be abandoned following a multi-car accident at Barcroft, with the Tamworth-based driver amongst those to have spun off on oil dropped on the track. 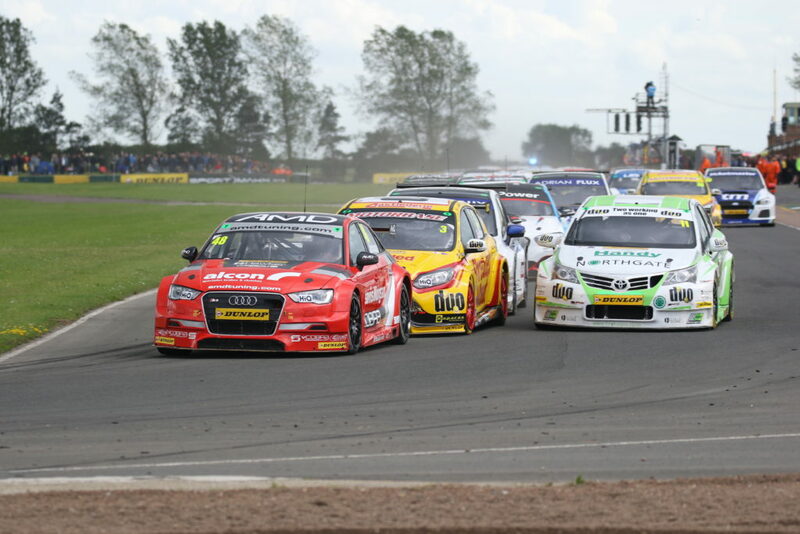 A strong drive in the opening race saw Ollie work his way forward into the points, with the Audi battling into the top ten until a move from the Subaru of Jason Plato at the final corner saw him slip back to eleventh at the flag. A post-race penalty for gaining an unfair advantage demoted Ollie back to 13th spot, which is where he would then start the second race of the weekend. Undeterred, another strong drive saw him bring his car home in ninth spot for his best result of the season so far, and a first top ten for the team with the Audi. The reverse grid draw then put Ollie on pole for race three, and he maintained his position out front through the opening lap before the Safety Car was deployed due to an incident further down the order. On the restart, Ollie’s hopes of maintaining his lead were ended at Sunny In when a hit in the rear from the Ford of Mat Jackson saw him run off track and drop down the order. The end result was a tenth place finish, although the results from the weekend still allowed Ollie to break into the top 20 in the overall points, with two third place Independents finishes moving him up to eighth in the Indy standings. “I’m ecstatic with the results this weekend,” he said. “Things are coming together now and we have threatened to get these kind of results for a while; luck just hasn’t always been on our side. “The car was great all weekend and I’m delighted for the team. We’ve been on the pace and have picked up two top ten finishes on merit because we had a quick car, and not just because others have fallen off and given us the places. “It’s a shame that the incident in race three hit our chances of a stronger result there, and as things panned out, I feel we genuinely could have challenged for the podium – and certainly brought home a top five finish. Team-mate Ant qualified 26th having also been caught up in the qualifying drama and was unlucky to miss out on points in the opening race after a strong drive saw him come through the grid to 16th place. The Lichfield racer continued his forward progress in race two however, lapping quickly and consistently in an impressive performance that saw him finish in eleventh spot and best of the rookie drivers. More points looked assured for the reigning Clio Cup UK champion in the final race of the weekend as he ran well inside the points in the early stages, but contact from a number of his rivals would ultimately see his battle-scarred car just miss out on the top 15 positions. “I was really happy with where we were after the second race as we’d made good forward progress and came close to breaking into the top ten,” he said. “We’d made some changes ahead of the second race and the car was strong on the harder tyre, and I felt confident we could continue to push forwards in race three. “Unfortunately, I just got smashed out of the way by other people in race three which is annoying, but that is how it is sometimes in touring cars. We’ve certainly showed this weekend that we have the pace, and there is no reason why we couldn’t have joined Ollie in bringing home a top ten finish. Team manager Rob Tickner – overseeing the Audis with team boss Shaun Hollamby on duty with AmDTuning.com’s GT programme at Silverstone – was pleased with the results on track and said it left the team in a good position going into the summer break. “We’ve shown that we have good pace with the Audi already this season, and it’s good that we’ve been able to back it up with some good results this weekend,” he said. “It’s been our strongest showing with the Audi, and both Ollie and Ant have driven well to bring home some strong points. Everyone involved with the AmDTuning.com with Cobra Exhausts team sends their best wishes for a full recovery to Jeff Smith, Luke Davenport and Aron Taylor-Smith following Saturday’s qualifying incident. Image credit to Marc Waller.